Loch Ard Gorge is situated in the Port Campbell National Park, and is one of the highlights along the Great Ocean Road. It is also the historic site where the only two survivors from the Loch Ard shipwreck washed ashore in 1878. Loch Ard Gorge is a spectacular setting, a cosy protected enclave with soft sand, surrounded by the powerful cliffs and an ever-changing magical gateway to the ocean. It is an iconic location perfectly matched to provide the ultimate natural theatre for The Tempest. These are some special notes for performances at Loch Ard Gorge. You will also receive an email with additional information once you have booked your tickets, please read all the details below and the email, so you can be fully informed and prepared beforehand. No chairs are permitted. Please be aware this location is accessible only via a stairway of approximately 70 narrow steps, unfortunately this may not be suitable for all, however we do have other locations within our tour which might suit those with mobility concerns, see our website events page for options. We appreciate your understanding and acceptance of these conditions. 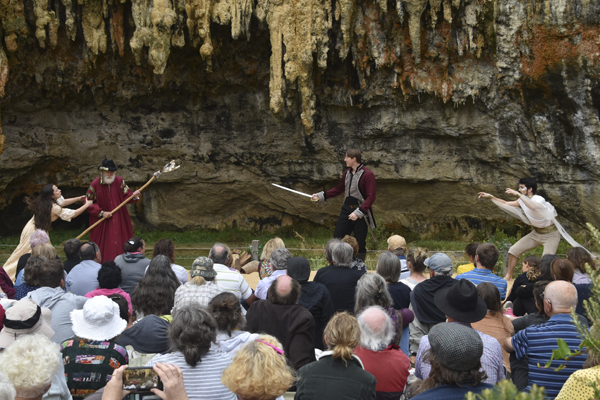 Loch Ard Gorge on Victoria's Shipwreck Coast is an iconic setting for Shakespeare's Tempest and we are pleased to be able to return to this spectacular location and happy to do what we can to to help to ensure this as an annual performance location once again for OZACT productions.